Today my wife and I had the opportunity to spend some time with my parents. 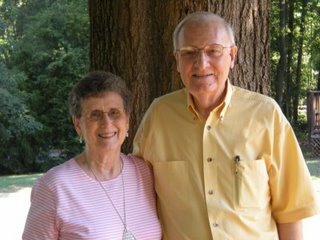 Mom and dad have been involved in pastoral church ministry since the early 1950’s. As we talked, I asked Dad what he personally considered to be some of the most rewarding things about ministry life. As he reflected back over the years, I heard real joy in his voice as he reminisced about some of the people he had the privilege of leading to the Lord, some who have gone on to heaven and many others who continue to serve the Lord today. He spoke of several of these folks by name, and with genuine affection. I could sense the pleasure and satisfaction he felt in knowing that he had made and continues to make a difference with his life for the sake God’s Kingdom and people. As I reflected on their 50+ years of pastoral life and experiences, I was reminded of some of the things I believe to be essential keys to effective ministry. At the top of list is a love for people. To have an effective ministry a person must possess a true love for people and for their welfare, now and eternally. Mom and dad certainly demonstrate this kind of love. Second, effective ministry is the result of a commitment to stick with it — living and serving with endurance and faithfulness. Mom and dad, by their example, have proved that fruitfulness and fulfillment come with a lifetime of faithful service to God and others. I am so very proud of my parents. Through the tough and challenging times of ministry, as well as the joyous times, I have watched them live with integrity, passion, commitment and incredible love for the local church. What an example they have set for me, and I honor them!